Totally refitted and decorated in 2013 the kitchen is designed for both self and outside catering. Two sinks are provided, one for hand washing, the other for food preparation. 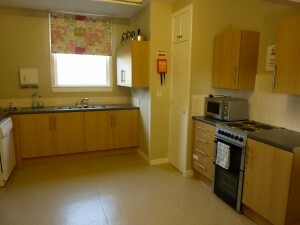 The kitchen is heated and fitted with a cooker, dishwasher, refrigerator and microwave. Cutlery and matching crockery for up to 60 people is provided together with table linen and napkins. The large serving hatch, which links directly to the hall, makes serving food easy and wall mounted optics makes the operation of a bar, simple. An immersion heater provides hot water and there are two kettles and an urn for hot drinks. Comfortable, matching, modern chairs allow hirers to seat up to 70 people, or accommodate 60 people seated at tables if serving food. 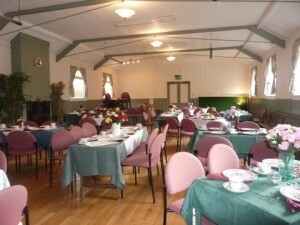 Tables come in a range of sizes so the hall can be set up like a cafe, or buffet style. A raised area provides a stage for performances, or speeches, with overhead lighting and power sockets. There are also power sockets on all four sides of the hall. Leading directly off the hall are ladies and gents toilets.